A leading text for courses that go beyond the basics of family systems theory, intervention techniques, and diversity, this influential work has now been significantly revised with 65% new material. The volume explores how family relationships--and therapy itself--are profoundly shaped by race, social class, gender, religion, sexual orientation, and other intersecting dimensions of marginalization and privilege. Chapters from leading experts guide the practitioner to challenge assumptions about family health and pathology, understand the psychosocial impact of oppression, and tap into clients' cultural resources for healing. 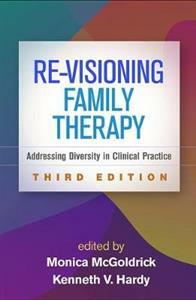 Practical clinical strategies are interwoven with theoretical insights, case examples, training ideas, and therapists' reflections on their own cultural and family legacies. New to This Edition *Existing chapters have been thoroughly updated and 21 chapters added, expanding the perspectives in the book. *Reflects over a decade of theoretical and clinical advances and the growing diversity of the United States. *New sections on re-visioning clinical research, trauma and psychological homelessness, and larger systems.